Channel letters are the lettering that you primarily see on retail stores. They are individual letters that are fabricated from aluminum and have acrylic faces to allow the LED lights to shine through. They light up at night and help to draw customers to your business. These letters have many varieties and until you see them at night, you may not realize how the light can create a different effect. The most common type of channel letters are Front lit. These signs emit light from the front (face) of the letters. This type of channel letter can be either raceway or flush mounted against the wall. Logo boxes are often added to the channel letters to give additional interest. The raceway is a box behind the letters that all the wiring for the sign is located. There are less penetrations through the wall when a raceway is use. When channel letters are mounted directly to the wall, each letter can have 2 to 5 penetrations. The wiring is done behind the wall and access is required to service the sign. These signs provide a halo around the letters. As the name depicts, the light comes from the back of each letter. The letters are basically fabricated the “reverse” of front lit. The faces are solid aluminum and custom painted. A clear polycarbonate back prevents birds from nesting inside the letters. This type of letter option provides a distinctive look to the sign. This is an excellent choice for a dramatic, eye catching look. As the name implies, these letters light from both the front and back . 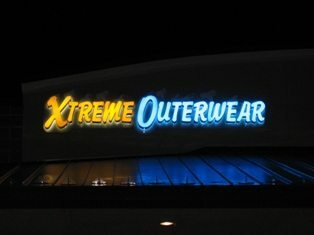 The combination of both front and rear illumination makes the sign vibrant and bright. Signarama, has the ability to fabricate top-quality channel letter signs and dimensional logos for your business. If you’re looking for highly visible, conspicuous, noticeable signage, call Signarama today at 303-914-9700 to discuss channel letters and various options to make your business signage the best it can be to attract customers.